Sorry, but that’s my approach to athletes who are credibly connected to the use of performance enhancing drugs. The Al-Jazeera report that came out Saturday included taped conversations with Charlie Sly, who worked for the Guyer Institute, an anti-aging clinic in Indianapolis. Sly told Liam Collins, a British hurdler working undercover, that he gave James Harrison of the Steelers Delta-2, a drug that is used too mask steroid use. The report also claimed that Guyer shipped HGH to Peyton Manning under his wife’s name. Of course, Harrison and Manning both gave strong denials and Manning has raised the possibility of a law suit. Meanwhile, Sly says he was only an intern at the time of the recordings and that he was just kidding. You can buy that if you’d like. Lots, if not most of the people in the media seem to be buying it. Sorry, but I’m going with a presumption of guilt. It’s not a court of law and I’m not a juror. A long time ago, after hearing way too many indignant denials –including some that came with tears – from athletes expressing shock and dismay that anyone could suspect them of cheating, followed by those athletes admitting to or being caught using PEDs, I decided to presume guilt. I don’t have any official numbers for you, but I think I’m batting about .900 with that approach. I never believed Lance Armstrong and I believed Jose Canseco from Day 1. 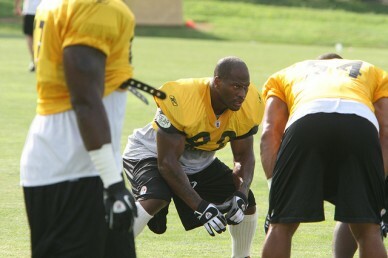 Can I prove that James Harrison uses PEDs? Of course not. If you hooked me up to a polygraph and asked me if I think he does and I said no, the machine would say I’m lying. I think if you hooked the local media up to the polygraph and asked them, 90% would be found to be lying when they said no. Have you seen how much NFL players, including some former Steelers, now working in the media, have shrunk? Several years ago, I did my first of several interviews with Dr. Charles Yesalis, an epidemiologist and professor at Penn State, who has been studying the use of steroids and other performance enhancing drugs for almost 30 years and testified before Congress several times on the subject. He laughs at the testing programs in all the major sports leagues. Back in 2008, Dr. Yesalis was on a panel at Penn State with Mark Fainaru-Wada and Lance Williams, co-authors of “Game of Shadows”, the book that touted Barry Bonds as a big time juicer. Yesalis told the panel that he believes “Upwards of 95%” of NFL players use HGH and he said HGH use among college football players has been greatly under-reported. For the record, I don’t care what James Harrison takes or doesn’t take to keep playing at a high level at 37. But the people running the major sports leagues need to stop insulting our intelligence by saying that they care. And way too many in the media should be embarrassed by their inability or unwillingness to smell the BS.